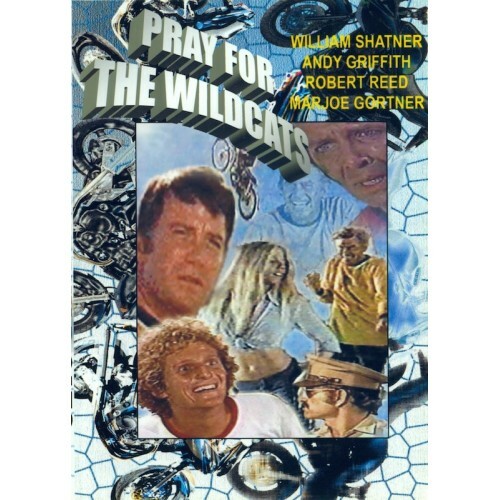 Join us for the Greeley Grindhouse on Thursday, March 6th as William Shatner, Robert Reed and Andy Griffith bike their way into trouble with the screening of Pray for the Wildcats made in 1974. The show begins at 7:20 p.m.
Pray for the Wildcats originally aired as an ABC Movie of the Week. This thriller-drama draws you into the world of a psychopathic business executive chasing his workers on dirt bikes through the desert after he killed a young man. This film has big stars including William Shatner and Andy Griffith. And, here’s a little more about Pray for the Wildcats. Sam Farragut, played by Andy Griffith, is a sociopathic business executive in Southern California who raises the marketing stakes by making a team of advertising agency employees, (William Shatner, Robert Reed, and Marjoe Gortner) embark on a dangerous dirt bike trip to the Baja California desert in order to compete for his business. The group of men being considered for the job includes Warren Summerfield (Shatner) a suicidal middle-aged ad executive who has been fired from the agency; Paul McIlvain (Reed) who is inattentive to his wife, Angie Dickinson, and an art designer Maxon (Gortner) who has recently found out his girlfriend (Janet Margolin) is pregnant. Farragut convinces the men to make the motorcycle journey in order to find a location to shoot the commercial. However, Farragut has other plans and is looking to involve the men in a crazy adventure. After they leave, McIlvain’s wife suspects that Summerfield is planning to kill himself for the insurance money, but she cannot convince Summerfield’s wife to instigate a search. So what will happen in this group of men competing for business? Who dies and who stays alive? Show up to find out! This entry was posted in Entertainment and tagged andy griffith, free movie, Greeley Avenue Bar and Grill, Greeley Grindhouse, Grindhouse, places to eat, pray for the wildcats, things to do in Portland, william shatner by greeleyave. Bookmark the permalink.